We are listing some of the most commonly asked questions we receive here…and their answers. We have further questions answered on the host families page. The Association for Teen-Age Diplomats is a non-profit, all-volunteer organization established in 1951. ATAD coordinates high school exchanges between the Rochester area and many of Rochester’s Sister Cities, as well as cities in Turkey, Peru and Mali. teenagers all can be wonderful Host Families. Families must have a successful interview with an ATAD representative. What are the expectations of a Host Family? A Host Family provides a bed, study area, and three meals a day for the exchange student. The expectation is that the exchange student will be an integral part of the family. This is a home stay for the student to experience ordinary family life. The Host Family is not expected to give the student an allowance; the student provides his/her own spending money and health insurance. 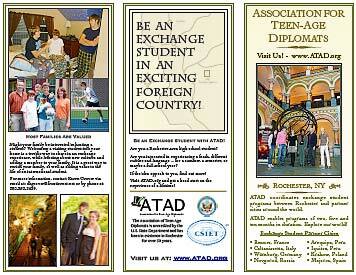 tailored to exchange students can be purchased through ATAD at a very reasonable cost. For International students applying to go to the Rochester area: United States law requires a special type of insurance for exchange students coming to the US. The insurance must be purchased through ATAD, and meets all United States requirements. Can I travel while overseas? ATAD is a home-stay program, not a travel program. ATAD does not permit independent travel. Students should not expect to visit family or friends while overseas. country at the end of the program. A support person is assigned to each student and family and is in contact with you on a regular basis. Interaction with your student’s ATAD Liaison is important in sorting out any misunderstandings and conflict. ATAD advisers have a great deal of experience with past students. We also provide significant support and orientation training during the placement semester or year. If a problem arises, the ATAD support network is there to help resolve the situation.